Tall poplar trees and orange pantile villa roofs contrast with the deep blue sea that stretches out along this part of the aptly named Cote d''Azur. 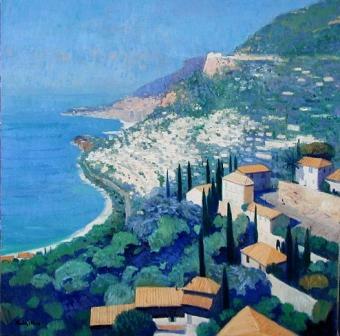 John Kingsley shows his skill with colour, light and shade in ''Monaco from Roquebrune-Cap-Martin''. A long-standing member of the Glasgow Art Club and Group 81 John Kingsley has established a reputation as a leading Scottish contemporary artist.